In its January issue TRUE said that the flying saucers are real and interplanetary. Its story was widely supported by the nation's press and radio. TRUE's findings are here confirmed by Commander McLaughlin, a rocket expert at White Sands Proving Ground, who worked independently of this magazine's investigation. He reveals how a troup of Navy men and scientists tracked a flying disk with a precision instrument and tells of flights he and others witnessed. On a bright, clear Sunday morning in April, 1949, a detachment of Navy men and a group of scientists released a balloon from a point 57 miles northwest of the White Sands Proving Ground base. They were interested in getting weather data from the upper atmosphere, and as the balloon rose, they charted its flight as usual with a theodolite and a stop watch. There were five observers in all; four of them coordinating the instrument data. One followed the balloon through the theodolite's telescope. One called off the readings. One recorded them, and the fourth man held the watch. Shortly after the balloon was aloft west of the observation point, the theodolite operator swung his instrument rapidly to the east. A strange object, seen by everyone present, had crossed the path of the balloon. The instrument man, confused, had followed it. Swiftly, one of the scientists grabbed the theodolite and began tracking the missile. On a bright, clear Sunday morning in April, 1949, a detachment of Navy men and a group of scientists released a balloon from a point 57 miles northwest of the White Sands Proving Ground base. They were interested in getting weather data from the upper atmosphere, and as the balloon rose, they charted its flight as usual with a theodolite and a stop watch. There were five observers in all; four of them coordinating the instrument data. One followed the balloon through the theodolite's telescope. One called off the readings. One recorded them, and the fourth man held the watch. Shortly after the balloon was aloft west of the observation point, the theodolite operator swung his instrument rapidly to the east. A strange object, seen by everyone present, had crossed the path of the balloon. The instrument man, confused, had followed it. Swiftly, one of the scientists grabbed the theodolite and began tracking the missile. 1. 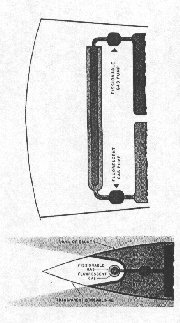 The object, viewed in cross section, was elliptical in shape. 2. It was about 105 feet in diameter. 4. Its speed was about 5 miles per second. 5. At the end of its trajectory, it swerved abruptly upward, altering its angle of elevation by 5 degrees -- corresponding to an increase in altitude of about 25 miles -- in a period of 10 seconds. Rough calculation indicates that a force of more that 20 G's (20 times the pull of gravity) would be required to produce this elevation in this time. 6. The object was visible for 60 seconds. 7. It disappeared at an elevation of 29 degrees. Close questioning of the observers prior to the official report that went to "Project Saucer" at Wright-Patterson Field in Dayton, Ohio, produced an almost unanimous judgment that the objects was discus shaped and that it was a flat white color. High powered binoculars showed no exhaust trail, no stream of light or other evidence of a propulsions system. And, no sound. What was it? I am convinced that it was a flying saucer and, further, that these disks are space ships from another planet, operated by animate, intelligent beings. I think it is safe to say that it wasn't any type of aircraft known on Earth today. Even if, as is likely, there are top secret models which you and I know nothing about, there is no human being in this world who could take a force of 20 G's and live to tell about it. I doubt that it was meteor. These small bullets from space frequently light up our sky as they burn, from friction generated by hurtling through our atmosphere. But only occasionally are they visible in the daytime. And besides, meteors remain in view for only a few seconds -- 10 or 12 at the maximum. This object was watched for 60 seconds. Its size rules out the possibility of its being a bird or other known creature. No cloud could have moved in such a trajectory. It was not a balloon, I can state positively. A number of men who saw it were experienced balloonists. Furthermore, they were in a position to know that no balloon capable of approaching the object's altitude was in the area. Even at 120,000 feet, near the peak altitude for any present type, a balloon would have to have been moving at 1,700 miles per hour to conform to the trajectory data. And to clinch it, the wind 20 miles up was, as it happens, moving from east to west -- opposite to the motion of the object. Hallucination? Optical illusion? I think it is reasonable to say that illusions do not appear simultaneously and identically to five different trained weather observers. I cannot think of any other possibilities. Reliable observers saw the object. A sensitive instrument tracked it. The atmosphere was bright and clear in an area where we considered it a dull day if you could not see 50 miles horizontally with the naked eye. The only flaw was that I -- up to that time -- had not seen a Flying Saucer personally. Nonetheless, the information excited me. I began to seek an explanation -- a respectable, convincing answer in terms of physics, mathematics, aerodynamics and astronomy as we know them today. Before I had completed my theories, I saw a Saucer for myself. On morning late in May, I was standing outside of my office at the White Sands base during the flight of an Army upper atmosphere missile. These, of course, rise much faster than a balloon and usually you loose sight of them shortly before they reach peak elevation. You are very fortunate if you can spot them again on the way down. The missile had just been fired, and we had just lost sight of it when a lieutenant commander standing next to me yelled: "There it goes." A Marine captain and I saw what he was pointing at. (A civilian engineer and a Marine major with us did not.) A white object was proceeding very slowly westward. As I watched, it rapidly gained speed. The object had now passed overhead, and I thought it was going to fall near a ranch house two or three miles west of us. But it spurted like a scalded cat, shot over the Organ Mountains behind us and disappeared. This was a very serious matter to us. We always took precautions to prevent missiles from leaving the range. Immediately, I phoned the range safety officer. "I've just seen your missile leave the range to the west of here," I said. He groaned. As we debated what to do, we both heard the thudding impact of our missile well to the north of us and in the center of the range. What, then, had I seen? I now faced the problem of every Flying Saucer witness. What was truth? What was imagination? Two Saturday Evening Post articles last year by Sidney Shalett concluded that the disks were hallucinations, upper atmosphere weather balloons, astronomical phenomena, or the result of vertigo or self hypnosis. In the January issue of this magazine, Donald E. Keyhoe, aviation expert for TRUE, asserted that the saucers are visitors from another planet. I thought back as carefully as I could over what I had seen. I realized I was slightly better off than most witnesses. I had not expected to see a Saucer, but I had expected to see something. My eyes, fairly used to this kind of observations, had been looking for a fast moving missile. 1. The Saucer, at the time it was first sighted, had been going at an extremely slow speed, perhaps 1 mile per second. 2. Despite the relative slowness, I could not determine its shape, although I judged it was similar in size to Saucer No. 1 because it was visible at an altitude above 25 miles. 3. It accelerated to a speed far in excess of anything obtainable with present day rocket motors. 4. The object passed within 5 degrees of the sun and was still visible to the naked eye. This would hardly have been true if the the object had been a meteor. 5. Again, there was no evidence of a propulsion system. The last appearance of Flying Disks which I feel is reliable enough to report occurred in early June. I did not see it personally, but the circumstances are impressive enough for me to include them here. At about the time the Navy missile was doing well over 2,000 feet per second, the object on the west side passed through the exhaust gases and joined its friend on the east. They then apparently decided the missile was not going fast enough for them. They accelerated, passed the Navy missile and sailed off upward and eastward. Some eight minutes after the Navy missile had fallen back into the range, I received a radio report from a very powerful optical observation post located on a mountain top. The Navy missile, it said, had just passed over the mountain and was going out of the range to the west. This could have been one of the two objects that we had seen and which had changed direction, or it could have been a third one. The odd thing is that before long I had reports from eleven men in five separate OP's, none of which could communicate with each other and which were located at different points of the compass. All had seen the two objects perform as I have described. Putting together all the data observed in three appearances, one of which I had seen for myself, and all which I believe beyond doubt, I decided that it was necessary to look outside the known world for an answer. No one realizes better than I do that the explanations which follow may be incorrect. I think, however, that there is too much evidence from too many reliable sources for us to be content with inconclusive explanations, and we must press on to find an answer. I think that the saucers are piloted space ships, first, because of their flight performance. The White Sands Saucers were most definitely capable of changing their direction while above our atmosphere. This extreme maneuverability -- plus their large size -- eliminates for me the likelihood of their being operated by remote control. My own experience with rockets leads me to feel that a Saucer with such characteristics is far beyond the technical powers of anyone on earth. Our present system of rocket propulsion, using thermochemical energy, is entirely inadequate to duplicate the terrific 5 degree gain in altitude observed during the flight of Saucer No. 1. If you accept this, you are led to assume that the Saucers can be propelled only by power derived from the atom. What kind? And how? Well, I suggest a "radiation pressure motor." Radiation pressure is one of the oldest known physical phenomena. You have seen it work if you have ever noticed a little glass enclosed gadget that jewelers often place in their shop windows. This is the "Crookes radiometer," a device more that 100 years old. Inside a small glass globe four metal vanes, black on one side and silver on the other, rotate on an axis, although there is apparently no motor driving them. Light supplies the power. It radiates a "push" that varies from the surface of one vane to that of the one next to it. Now, where could the Saucer engineers get enough light to propel their missile through space? I envision a motor somewhat like a fluorescent lamp. An inner core is filled with fissionable material, probably a gas. An outer tube surrounding the core contains a fluorescent material. The fissionable gas activates the fluorescent material, causing light. Light exerts pressure -- a propulsive push or thrust -- against a heavily shielded curved reflector. The push propels the missile. The activity of the fluorescent material is controlled by increasing or decreasing the amount of fissionable gas in the inner core. And fluorescent material is pumped into the outer tube as it is used up. This is greatly oversimplified, and certain major problems remain. There is, for instance, no known substance out of which the tubes could be constructed. Any material we can compound would disintegrate under the fissioning process. I would also hesitate to say what kind of shield would completely protect the Saucer crew from radiation effects. The theory of a radiation pressure motor has been discussed with experts at a number of universities. Some scoffed. Some were encouraging. Since our present investigations of atomic power are in the primer stage, however, I think it's early to say the idea is impossible. Let's simply admit that if the Saucer people utilize anything like this principle, they have probably refined and perfected it. While I have my neck out really far, I'd like to add that a Saucer would use three sets of motors. The main set would be used to launch it and propel it on its space voyage. These motors would be placed in one segment of the edge of the disk. A second set, probably located in the flat under surface of the disk, would be used to sustain it in flight while it hovered or prepared to land. The third would be a small set to control roll and tilt. 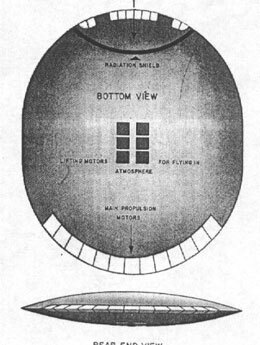 Since radiation from the main power plant might be great, I should imagine that the crew would be confined to a segment of the leading edge of the disk. This would leave a large area of the midsection for fuel storage tanks, food supplies and other equipment. One case, described by both Shalett and Keyhoe, involves a disk conforming to this pattern. At 2:45 a.m., on July 24, 1948, an Eastern Airlines DC-3, enroute to Atlanta, Georgia, from Montgomery, Alabama, sighted a "brilliant, fast moving object" about a mile away. Captain Clarence S. Chiles, an ex-Air Transport Command flier, and Pilot John B. Whitted, formerly a B-29 pilot, both observed it clearly. They agreed that it was about 100 feet long, shaped like a cigar. It was wingless. When the object passed them, at about eye level, they saw two rows of "windows" along the fuselage. These glowed with a blinding white light. A dark blue light ran the length of the shape, along the underside. There was a red orange flame exhaust which rocked the DC-3 at the missile veered off and zoomed out of sight. It seems to me that rather than a cigar shaped fuselage, what the pilots may have seen was a disk, edge on. The two rows of ports would be the vents of the main power plant. The blue light came from the belly motors, thrusting downward to enable the disk to operate at the slow speed of 500 to 700 miles per hour which the pilots estimated. The flame I am less sure about. Possibly the fact that it was traveling within the Earth's atmosphere (the DC-3 was at 5,000 feet during the encounter) made exhaust particles visible. The jolt it imparted to the DC-3, however, is not surprising. I should say that the plane felt a light energy blast, a product of radiation pressure motor operation. The discus shape, as such, conforms to aerodynamic law and would provide a perfectly feasible flying machine. I believe, though, that the design is employed as a temperature compensating device. By varying the angle of tilt, the disk in its flight through space could control the amount of heat it received from the sun. Flat side toward the sun, it could absorb considerable heat, edge on very little. Design, construction and operation of the Saucers indicate to me that a very superior intelligence is at work. Not only at work, but present within the disks. I cannot believe that the ready maneuverability shown, for instance, by Saucer No. 2 in avoiding the uprising Army missile was remotely controlled. What these people look like I have no idea. Since I insist that they are actually at the controls of their strange craft, however, I must suggest that they are considerably smaller than we are. We already know that while 6 G's are a tremendous strain on the human frame, creatures smaller than ourselves can bear up under incredible pressures. A bee can probably take 20 G's, an ant even more. Saucer crewmen would also have to be pretty small to ride Saucers No. 3, the 20 inch disks. It is staggering to imagine intelligent beings that small, but we must not disregard any possibilities. Where the Saucers come from can only be answered by guesswork. My guess is Mars. Mars "cooled off" and perhaps became capable of supporting some form of life millions of years before the earth did. The Martians, if such there be, would have a big start in scientific development. I believe that the frequency of the Saucers' appearance over the southwestern section of the United States may have been influenced by the relation of Mars to Earth on July 16, 1945. On this date Mars was in a good position to see our surface. And at 5:30 a.m. on that morning, the first atomic bomb was exploded in New Mexico, in the northwest corner of the present White Sands range. It is conceivable that the flash was viewed from afar by sensitive optical instruments. What are the Saucers up to? So far, their behavior would indicate that they are interested only in observing us. The fact that the Saucers' operations so far have been peaceful also seems to knock out the suspicion that they have been launched by a foreign Earth power such as Russia. If a nation were fiddling with long range missiles, why would it experiment over the United States, where a crash could deliver the object and all its secrets on our doorstep? Will the Saucers land? The small ones might. If their occupants decide they could survive on Earth, the small Saucers might be dispatched from the larger missiles. The larger disks, even assuming maximum motor efficiency, probably could not risk the loss of accumulated momentum that would occur in landing. It would be too difficult to generate again the momentum necessary to return home. Why don't you see Saucers? The atmosphere over about 75 percent of the Earth's surface is filled with moisture particles. These give us a "white sky" much of the time. Against such a background, it would be mere chance which allowed anyone to sight a Flying Saucer. At White Sands, we undoubtedly had near perfect atmospheric conditions and excellent visibility. I know that this is a fantastic story. I cannot prove the theories I have outlined. I probably can't even prove the disks are real until I've ridden in one. But in terms of the very limited knowledge we of the Earth possess, these ideas perhaps offer a clue to the solution of a great puzzle. Whatever the answer, I can't feel that there is anything terrible, hostile or dangerous about the Flying Saucers or their occupants. The challenge of space travel has fascinated the people of Earth for centuries. It is not fantastic for us to explore other planets, why should it be fantastic for Martians, say, to visit us? So far, all I have suffered is a little hurt pride. They got here first. Commander Robert Bright McLaughlin is an expert in naval ordnance and guided missiles. For the past three years he has been in charge of the Navy unit assisting in classified projects at the White Sands Proving Ground, Las Cruces, New Mexico. He began his researches in the guided missile field in 1939, four years after his graduation from the Naval Academy. A post-graduate student of engineering at that time, he was assigned to a Navy board evaluating the effectiveness of antiaircraft gunnery. 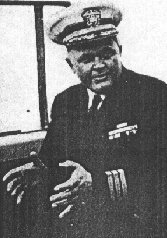 By 1941, he had outlined the technique for a "beam rider" guided missile which, by the ability to "change its mind" after being fired, heightened antiaircraft accuracy against swift, evasive, high altitude aircraft targets. During the war he was gunnery officer aboard the aircraft carrier Intrepid and saw action in the major Pacific campaign from Kwajalein to the Philippines. He was with the Intrepid when it underwent an attack by thirty three Japanese Kamikaze (suicide) planes in three and a half minutes. In August, 1946, he was assigned to White Sands. He is 37, a stocky, round faced man with curly brown hair, blue eyes, and a crisp, precise manner of speaking. He is married and has two youngsters, a girl of 2 1/2 years and a boy of 10 months. At present he is skipper of the destroyer Bristol. When the Air Force early this year declassified the hitherto secret Project Saucer files, it revealed that 375 incidents of "unidentified flying objects" had been analyzed by consulting scientists. Of these, 341 had been explained to the Air Force's satisfaction. It was officially admitted that for 34 incidents, there was no "apparent ready explanation." Among these was the opening incident of Commander McLaughlin's article. Even these 34, the Air Force said, might be rationally explained if the "psychological and physiological" factors were taken into account. But the Aero-Medical Laboratory, which was most concerned with such factors, acknowledges that "it will never be possible to say with certainty that any individual did not see a space ship, an enemy missile or other flying objects. All that is possible is to judge the likelihood that he saw such objects." In short, Project Saucer experts admit that statistical probability -- rather than scientific proof -- was the best it could expect to achieve. The Editors of TRUE believe that the admitted existence of 34 "unexplained incidents" indicates that the announced discontinuance of Project Saucer was premature. TRUE further believes that the official announcement was ill advised, made in haste, and that the United States Project Saucer has in fact been continued without interruption under another code name. The 34 "unexplained incidents" which the Air Force concedes -- there are no doubt others -- are the best documented and the hardest to explain in any fashion other than by the interplanetary thesis first set forth by Donald E. Keyhoe in TRUE for January and here repeated by Commander McLaughlin.